It has occurred to me that including some progress reports in this thread might be of interest. 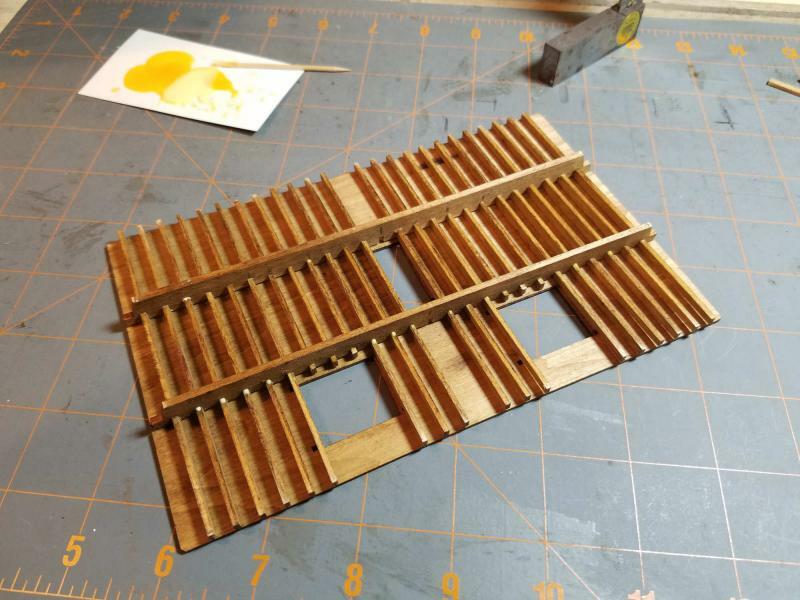 I am building the HO version of the BTS Slaty Fork lumber mill. It is an adventure for me, since my modeling history is thoroughly built around 1/4" scale. This mill is a bit of an aberration for this layout. In building this HO layout it was my intention to stick to R-t-R and simple plastic kits. A flash of inspiration changed all that. At least for part of the layout. 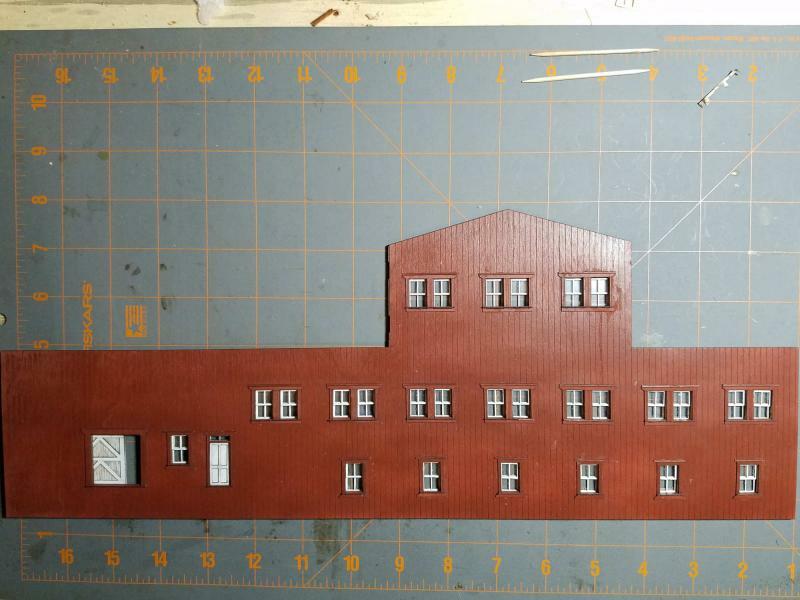 The instructions for the kit have one assembling the wall framing, attaching the sheathing, and then building the windows. My experience is that it is much easier to build walls flat on work bench and then join the completed walls together. I approached Bill Wade, of BTS, about my approach. He advised doing it according to the instructions. I fussed about it for about week, and then decided to do it my way. I will let you all know how that works out. The kit is extremely well researched and thought out. There are in excessive of 1,600 pieces. So, even though it is a laser kit, it is an ambitious project. 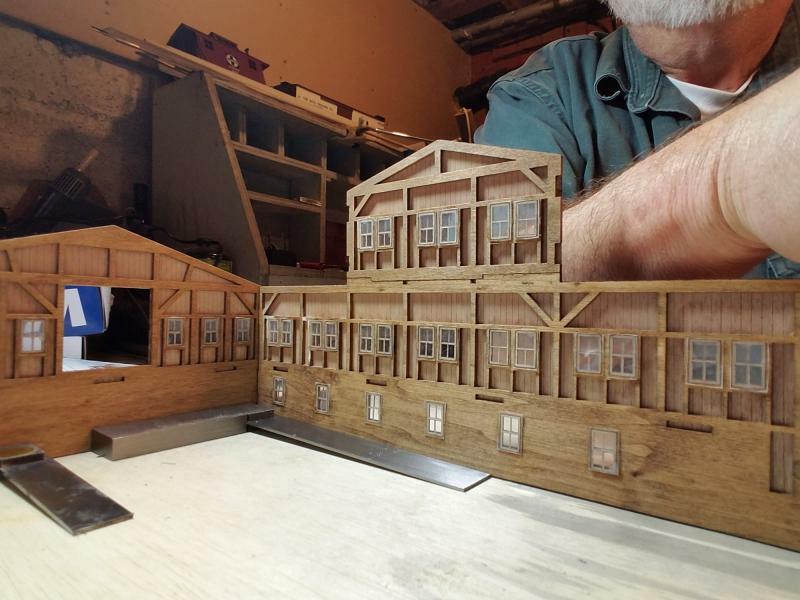 Having spent most of my modeling years in 1/4" scale along with my 70-year old eyes and hands, the size of some of the parts was a bit daunting. This assembly actually has a rather major mistake. But I am not telling anyone about it. 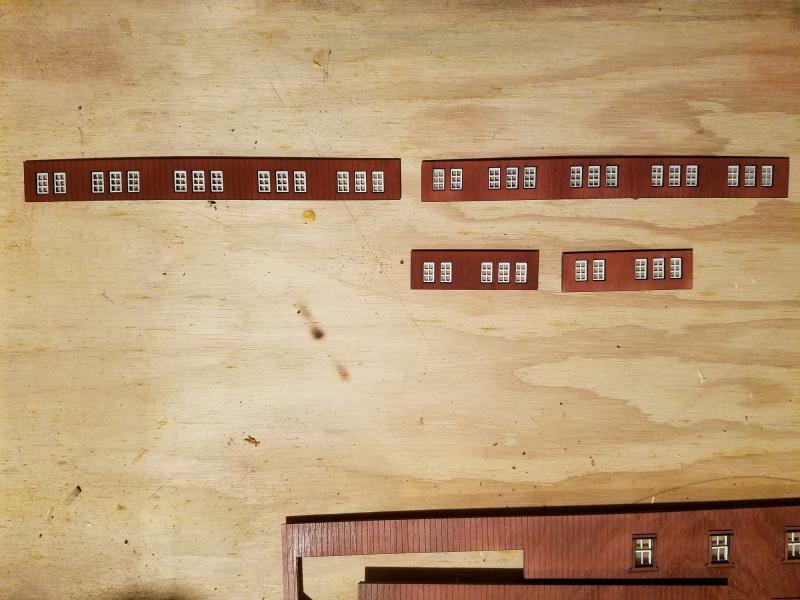 Each window assembly consists of seven individual parts. There are 27 windows on each of the long walls, with a few more on each end, in the saw filer room long wall, and the clerestory. This is the back side of one wall. 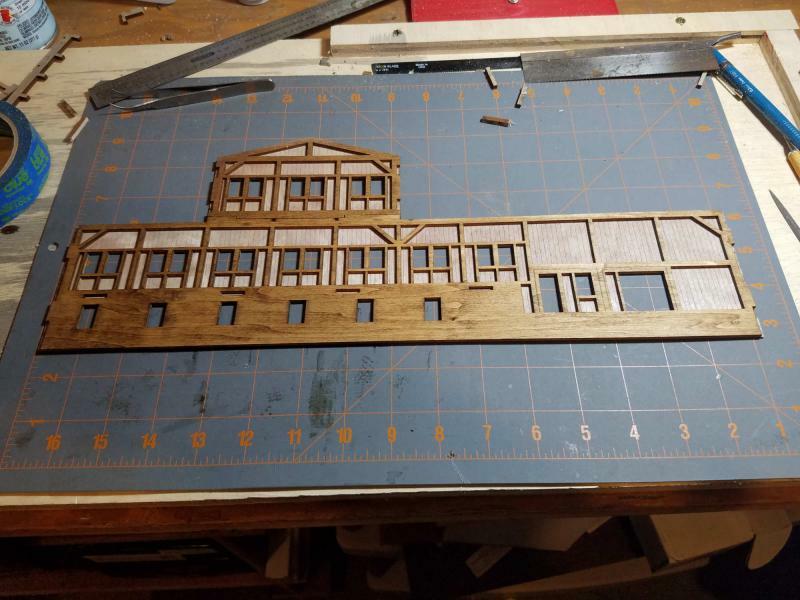 The framing is all one laser cut piece. And this is the "foundation". I learned a lot during the assembly of the foundation. 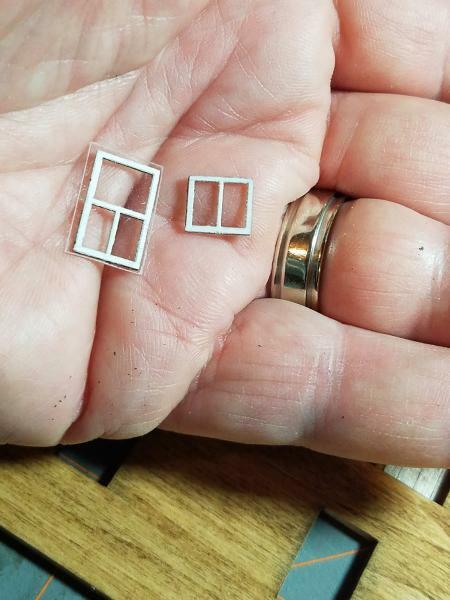 These HO scale parts can be VERY fragile. Especially with the grain. The slightest pressure parallel with the grain will break the part. The second bent in, you may notice, is a slightly different shade than the others. I succeeded in damaging the original so extensively that I had to fabricate a replacement. Being a laser kit it doesn't have quite the fabrication challenges of a true craftsman kit. But it is not a beginner's kit. Building up all the windows requires a good deal of patience and perseverance. The list of required tools is pretty short. I find the most used tools are a #11 Xacto knife (with a good supply of new blades) some emery boards, and a pair of curved tweezers. For this kit you want a pretty fine blade. BTS recommends scalpels from the local pharmacy. I find the smallest #11 handle to work well. I extend the useful life of my blades by having a fine sharpening stone handy. The blades get a couple of swipes every few cuts. Emery boards (yeah the ones your wife uses for her nails) are essential for final fitting. I recently refreshed my supply and got a life-times worth for $1.39 at a local variety store. The curved tweezers are useful for jockeying small parts into tight spaces. I am using the adhesives recommended by BTS. Titebond for structural assemblies, Elmers white glue for the rest. I used to use Alene's Tacky Glue because you could move along without having to wait for glue to dry. The problem is that Alene's remains water soluble forever. that might have been salvageable had I used Titebond. At this point I have both long walls completed and have started on the short walls and the saw filer room long walls. All 82 double-hung windows are complete. 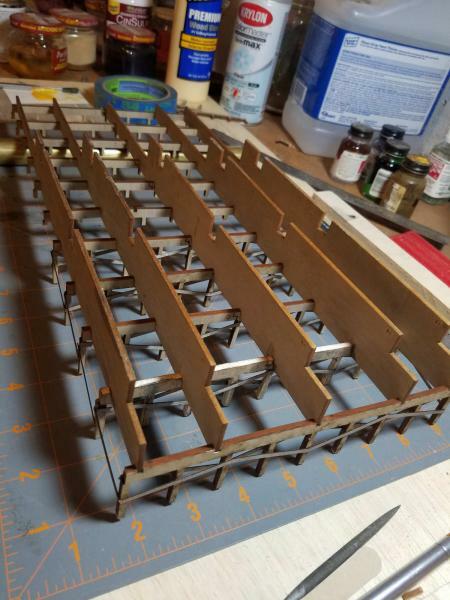 Ten of the clerestory have been completed. I tried to take a photo of all the walls. I just couldn't get far enough away. 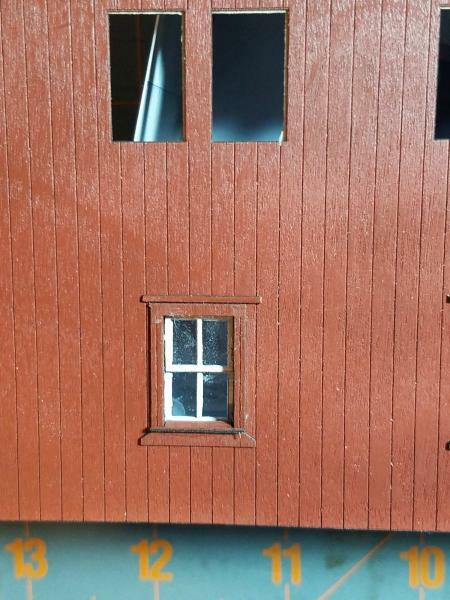 tried to make a window for a o scale blacksmith shop scratch build out of kitchen matches what fun!!! Yep. Sometimes I wonder about the wisdom of changing scales. But the project is moving along, even if rather slowly. I have the sashes done for all the clerestory windows. 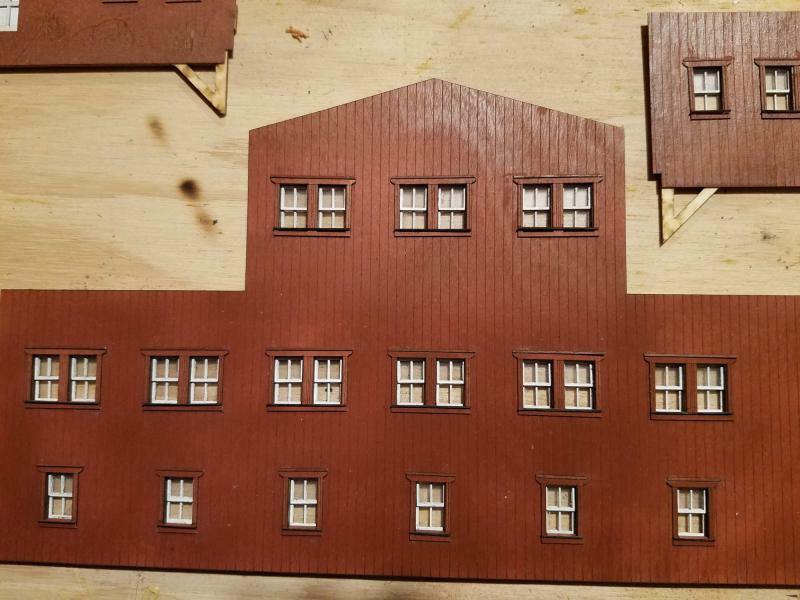 Once I trim those windows out I can move on to more exciting parts of the project. There are 82 double hung windows and 36 clerestory windows. The double hung windows are finished. More on the clerestory windows further down. The walls are being assembled. The machinist's squares are really handy. This is the step Bill Wade of BTS said would be troublesome with the walls sheathed. It is not clear from the instructions and photos how the clerestory walls are oriented. The windows are not centered top to bottom. I do like the framework and natural wood surface of the interior Reg, very appealing. to allow for the intrusion of the overhanging roof. If they were the other way round, they would be too high under the roof overhang which would block out some light. That is my thinking, too. But it doesn't hurt to wait until I can test fit. I found an anomaly in the sequencing. The instructions have one installing the filer room framing (the third story) prior to installing the lower and main floors. That would be a real project. Much easier to install the floors before installing the framing (actually, in my case, the completed wall assemblies) for the filers room aft that. Here is the under side of the filers' room floor. This is actually the final dry fit before gluing the framing to the floor. and a stair case from the rectangular opening extending down. Having delicate assemblies on both sides of the floor assembly is going to be a challenge. Here are the main floor and lower floor installed. but after carefully reading the instructions and dry fitting everything, I understood the BTS logic. 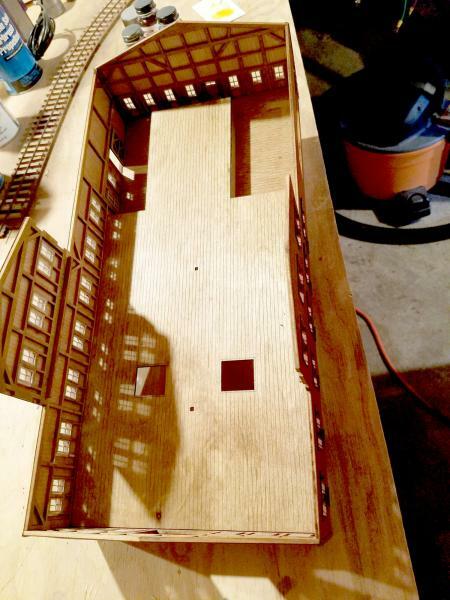 The lower floor actually attaches to the main floor and is installed from underneath. Makes perfect sense. I feel the need for model-building rant Number 3. The handlaid track in the background is left over from the previous On30 layout. Although I see myself as not being one blessed with patience, I have to agree with you about the motivation. If it's important and interesting enough it will get done, and impatience doesn't seem to feature.